Google Profile Information and Partner Content Providers: Should there be Disclosure? When you search for where a movie might be showing near you, or what the weather might be like in your neighborhood, or other kinds of information where it might be helpful if the search engine knew your location, or a location that you might prefer to see results from, a search engine like Google might try to identify a preferred location from your searches. The next time that I perform that search, I’m not shown a text box where I can enter my zip code. 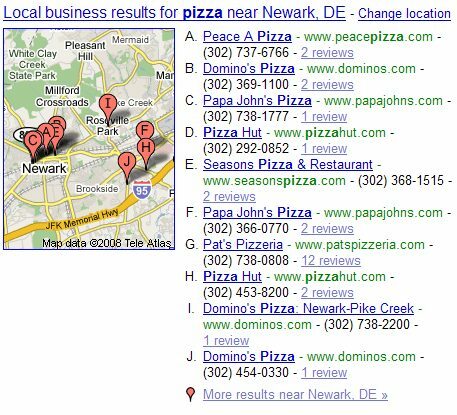 If I then perform a search for [pizza], without indicating a location or zip code, I’m also shown a map with the addresses of ten local pizzerias. While the pizza locations might be tied to the location of my computer, or my handheld if I’m using a smartphone or web enabled handheld, I tested it to see if I was getting results based upon my movie or weather searches. 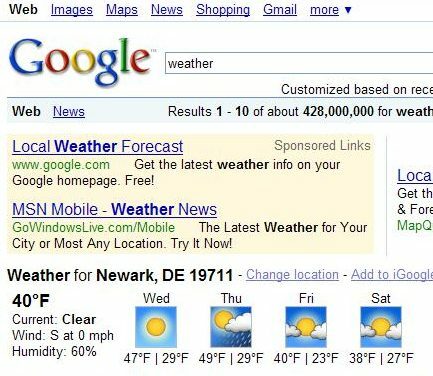 I went back to a Google [weather] search, and changed my location to another zip code in a different state. I then searched for [pizza] again, and the local search results shown to me were for that other state. The preferred location that you enter into Google doesn’t have to be the place you are searching from. It could be the area around where you live, or where you work, or where you might be traveling, or just someplace else that you indicate. If I don’t state a preferred location, the search engine might try to identify my location if I am using a handheld by GPS or cell phone tower triangulation. A recently published patent application from Google explores how location information, and other information associated with a mobile device, or a desktop computer could be collected as “profile information” about a searcher, and could be used to present a searcher with search results specifically tailored for them. The patent also discusses how that profile information could be shared with a partner content site to provide additional information to searchers. 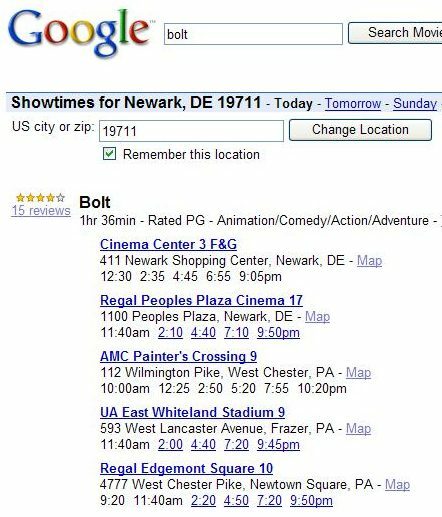 For example, in the movie listings that Google provided to me was a link to the IMDb page for the movie that I searched for – Bolt. Other content partners could also be used, and some of those might be able to provide customized information to a searcher if Google shared profile information with them. Location or other information sent to the partner content provider might not come from information stored in a profile before a search, but could also be taken from the search query itself. 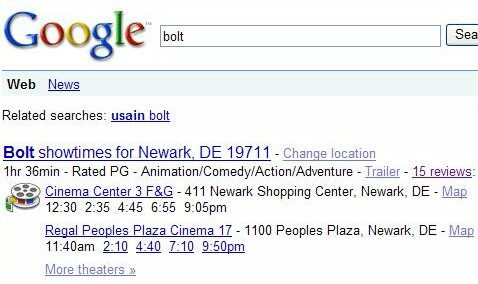 So, If someone typed in [Omaha Nebraska bolt], they may be presented with showing times for that movie, and information about the search might be shared with a content provider. Where do “Content Partners” Come From, and Should there be Disclosure? In some implementations, a designated partner content provider can have a particular relationship with the information provider. For example, the designated partner may have a business agreement with the information provider under which both entities work together to enhance users’ browsing experiences and derive mutual benefit as a result (e.g., increased advertising revenue or other product revenue, etc.). As another example, a designated partner may have a technology-based agreement with the information provider to use a particular protocol or data format to receive profile information provided by the information provider (e.g., through a search result link) and use the profile information to customized content in some manner. We don’t know if Google has entered into any arrangement with content partners to display specific information from them for a fee or some other consideration. If they were, I would suspect that some kind of disclosure would probably be appropriate. Should links to partner content provider pages be labeled with something indicating that they are advertising? Are they advertising? When you perform a search such as [london to paris], you see an area at the top of the search results that provides information about “Flights from London, United Kingdon to Paris, France.” There are text boxes under that were you can list a departing date and a returning date. Under those I see a list of links to “CheapTickets – Expedia – Hotwire – Kayak – Orbitz – Priceline – Travelocity.” Are these “content partners? Why those sites? Do they pay to be there? If so, should they be considered advertisements? 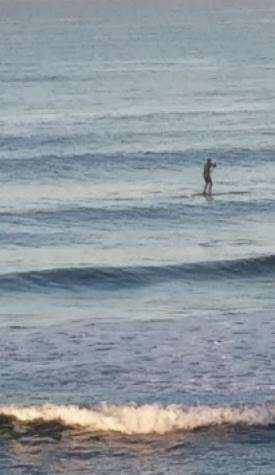 Should there be disclosure? Great post on the question of who are â€œcontent providersâ€ on Google. I have been watching these pop up more each day and I have to say I am right there with you on the advertising question. With Searchwiki (which I donâ€™t like) up and running I can remove whoever from my results, yet I am forced to see the deleted links thru â€œsponsored linksâ€ section. So if itâ€™s not labeled â€œsponsored linksâ€ shouldnâ€™t I have the ability to remove the link? Or is this going to be like the â€œlocal business results â€“ mapâ€ (which Google still has companies with bad addresses and P.O. Box for companies) that force placement of a company name based on geographical terms? Like any other good research report, Google’s search results should state their sources, particularly with material taken from content providers. Google is basically a public utility at this point and the equivalent of product placement (by not disclosing business agreements) would violate the implicit trust agreement that we have with search engines. Actually, you can also forget trust, the market decided that search engines need to be legitimate in their results by selecting engines without paid results as the most popular ones. So in a way, it’s actually in Google’s self-interest. I think a lot of this really depends on what type of information is being transferred from Google to the content providers. Any mention in the patent filing as to exactly what information would be provided? I suppose the detail and type of information provided would depend on the search itself and what the content provider was offering as well. Thanks. You raise some interesting points. I’m wondering about the “content partners” that Google does show, and if there is a business relationship with them or not. The patent application suggests that there may be one, but we don’t know that for certain. I would think that if there is, and Google is sending them information about searchers, that some kind of disclosure might be appropriate. I haven’t spent much time with searchwiki yet. I agree completely about disclosure. It really is a good practice for the search engines to provide information about whether or not there is some kind of business relationship with others regarding the content that they provide. I’m not sure that we can call Google a public utility, but it would be interesting to see the arguments for and against. 14. The system of claim 12, wherein the results formatter is configured to encrypt the profile information. 15. The system of claim 12, wherein the profile information comprises default location information. 16. The system of claim 15, wherein the default location information and a current physical location of the user device are geographically distant locations. 17. The system of claim 12, wherein the profile information comprises demographic information associated with a user of the user device. 18. The system of claim 12, wherein the profile information comprises technical specification information associated with the user device. 19. The system of claim 12, wherein the results formatter is configured to provide the search result and profile information in such a manner that selection of the search result by the user device causes the profile information to be transmitted to the partner content provider. So, demographic information about the user of a device used to search for information, or technical information about that device might also be included. The patent application description doesn’t go into much detail on that aspect of the claims. search engines into surveillance engines. something that could be rife for misuse from Government, and corporate misuse. Google has often told us that the information that they collect about us is used to provide us with a better user experience, and the information that they provide – movie times, weather, flight information, etc., can be pretty useful. But, yes, it is a little worrisome that so much information is collected about us. There is a shift going on from providing us pages that match keywords we search with, to recommending pages that might be appropriate for us. Is it something that we should be worried about? Maybe. It would be a great feature, but it’s just not ready for prime time yet. I believe it lacks accountability for people who post their opinions in a forum that has almost 75% market share. That, and there’s too much haystack, without enough needles. About Google being a public utility, I was being somewhat but not completely facetious. Public utility implies government regulation, which I believe would have been necessary under a Google-Yahoo ad deal and may be warranted if Google engages an anti-competitive behavior based on its market strength. Government regulation of the information an information service like Google provides is a dangerous precedent, so that’s not the argument. It’s important to counterbalance a company that has the ability to form and shape what people see on the Internet based on its own corporate self-interest and the personal information it has amassed about its users. Bringing it back to the subject of your article, if Google doesn’t disclose its conflicts of interest and appropriate operational policies, there would be a good case for federal action, including regulation. I’m still considering some of the implications of searchwiki, but it’s interesting to see Google trying something that travels in a different direction. I can see Google throwing it out there, seeing what kind of reactions it evokes, and then deciding what to do with it. Thanks for your thoughts on government regulation and disclosure. I do think it’s a conversation worth having when it comes to an information resource that has so much potential to shape how we view the web, and the world. It’s unlikely that the applications that involve content partners, like the link to the internet movie database, or to the travel sites will be confused with paid or organic search, but they are being given some significantly high visibility on search results pages. I’m hoping to hear some more opinions on whether or not people believe that there should be some kind of disclosure of any business relationships with these content partners. I do agree with you on the issue of transparency in both maps and in the presentation of information from content partners. Finding where wrong information from data for maps can be difficult, It’s definitely a challenge; more than it should be. So Bill, the question I have is: Did you go see Bolt? Was the story worthy of Pixar or more Disney like? How was the animation? The situation is much like Google Maps where the data comes from various unaccredited sources (for the most part) and when there is a problem with the data, it is almost impossible to track back and find the bad source. Transparency is always preferable to obfuscation and would serve everybody well here and in Maps. Google has often told us that the information that they collect about us is used to provide us with a better user experience, and the information that they provide. There are text boxes under that were you can list a departing date and a returning date. That is in reference to information that you provide when you sign up for a Google Account, and provide Google with information through that account. One issue here though is that they are sharing information about searchers with third party content partners that may be paying for the ability to use that information, and to appear above the search results for a query. If these “content partners” are paying to provide that information, could that prominent placement be considered advertising? If so, should it be disclosed to searchers that there is a business relationship between those content providers and the search engine? Good read that. It does worry me how much information google collects. I read this morning on Searchcap that even disabling to Google Toolbar won’t stop them from tracking what you do. Kinda worrying to know there is very little you can do about your search habits thanks to the client server internet model. Google Toolbar Tracks Browsing Even After Users Choose “Disable”.